This app standardizes meeting information so that it's always readily available on your device, up to date, and clearly and consistently formatted. Additionally, it provides tools such as easy links to driving directions and tools to share meetings by email or text message. ALCOHOLICS ANONYMOUS PREAMBLE Alcoholics Anonymous is a fellowship of men and women who share their experience, strength and hope with each other that they may solve their common problem and help others to recover from alcoholism. The only requirement for membership is a desire to stop drinking. There are no dues or fees for A.A. membership; we are self-supporting through our own contributions. A.A. is not allied with any sect, denomination, politics, organization or institution; does not wish to engage in any controversy; neither endorses nor opposes any causes. Our primary purpose is to stay sober and help other alcoholics to achieve sobriety. 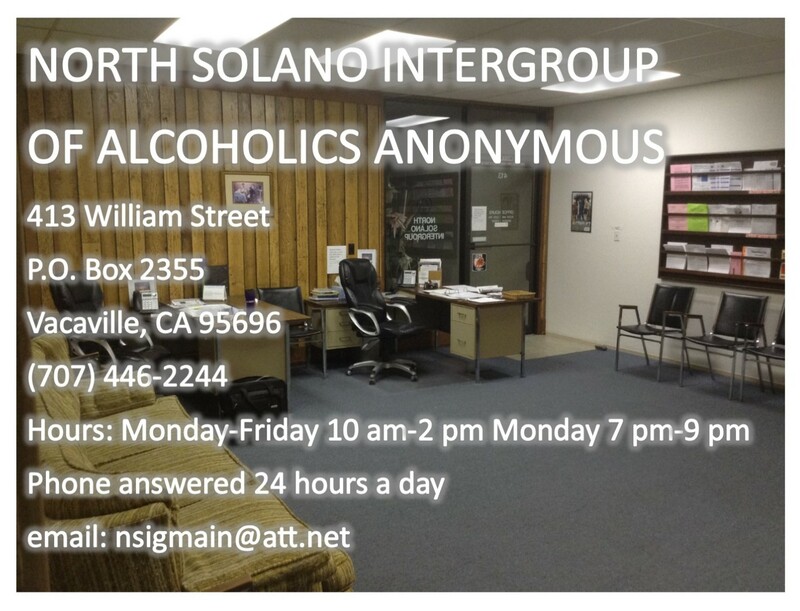 The purpose of the North Solano Intergroup is to support and aid the groups of Alcoholics Anonymous in their common purpose of carrying the AA message to the alcoholic who still suffers. We provide printed schedules of meetings, Alcoholics Anonymous books and pamphlets for sale and sobriety milestone medallions for sale as well. For the current price lists, please visit the Documents page.